Hari Kondabolu’s TruTV documentary The Problem With Apu first aired last November, offering up a critical examination of The Simpsons’ hard-working Kwik-E-Mart operator, along with the various cultural factors, writing decisions, and acting choices that led a white man’s caricature of an Indian accent to become a core component of one of the most popular institutions of American TV. 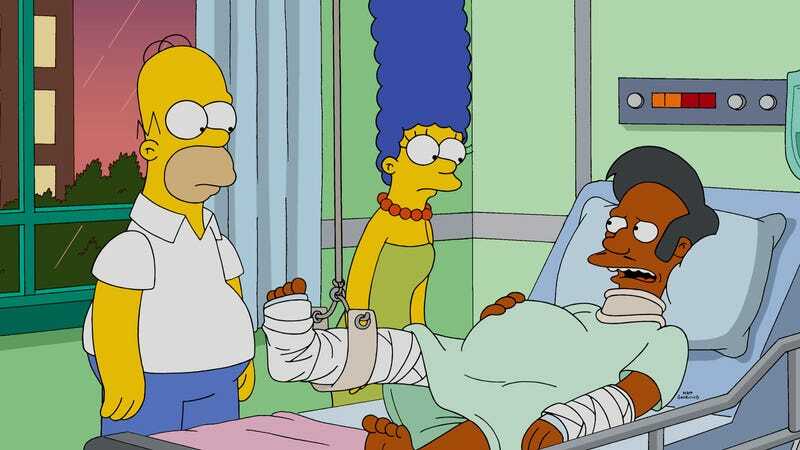 Operating at its typically leaden, animation-dictated pace, The Simpsons finally addressed Kondabolu’s documentary last Sunday night, offering an elaborate, very exhausted shrug that roughly translated to “This new PC culture, gosh, we sure don’t know,” and doubling down on the tone-deafedness of the argument by putting the words in the mouth of beloved firebrand and protector of the picked-upon Lisa Simpson. TruTV is firing back this week, in a way that is both cannily self-promoting, and a boon to anybody who missed the initial conversation: The network announced today that it’ll re-air Kondabolu’s documentary this Sunday night at 7 p.m., just an hour before The Simpsons’s regular timeslot. The press release for the announcement didn’t say anything specifically about “No Good Read Goes Unpunished,” the Simpsons episode that addressed the controversy, but the timing makes the motivation behind the move extremely clear.